Beef noodle soup is a Chinese and Taiwanese noodle soup made of stewed or red braised beef, beef broth, vegetables and Chinese noodles. It exists in various forms throughout East Asia and Southeast Asia. Beef noodle soup was first created by the Hui people (a Chinese Muslim ethnic group) during the Tang Dynasty of China. The red braised beef noodle soup was invented by the veterans in Kaoshiung, Taiwan who fled from mainland China during the Chinese civil war. In the North American Chinese communities, this food can be found in Taiwanese-style bubble tea houses. In China, a large bowl of it is often taken as a whole meal with or without any side dish. In Taiwan, vendors that sell beef noodle may also have optional, often cold side dishes, such as braised dried tofu, seaweed, or pork intestine. Beef noodles is often served with suan cai (Chinese sauerkraut) on top, green onion, and sometimes other vegetables in the soup as well. In Chinese, "牛肉麵" literally means "beef noodles". Mainland Chinese and Hong Kong restaurants also have a tendency to distinguish between "牛肉麵" "beef noodles", and"牛腩麵" "beef brisket noodles"; with the former containing either beef shank or beef slices and the latter containing only brisket. It is sometimes served with wontons. In Taiwan, "牛肉麵" typically consists of either brisket or shank only, though many restaurants also have tendon or a more expensive option with both meat and tendon ("半筋半肉麵", literally "half tendon half meat noodle"). If one orders "牛肉湯麵" or "beef soup noodles" in a restaurant in Taiwan, Mainland China, or Hong Kong, they might be given a very inexpensive bowl of noodles in only beef broth but no beef. If one orders a "牛肉湯" or "beef-soup", they could be given a more expensive bowl of beef broth with chunks of beef in it but without noodles. Beef noodle is often served as fast food in China, with Mr. Lee being the largest chain. In Taiwan it is considered a national dish and every year the city of Taipei holds an annual Beef Noodle Festival, where various chefs and restaurants compete for the "best beef noodle" title in Taiwan. There are two common variations of beef noodle which differ in the way the broth is prepared. When soy sauce is added, the soup is called red roasted or braised beef noodles (紅燒牛肉麵). Braised beef noodles was reputedly invented by KMT's Sichuan Province recruits who fled from mainland China to Kaoshiung, Taiwan. Therefore, it is sometimes (misleadingly) referred to as "Szechuan Beef Noodle Soup" (四川牛肉麵). The red braised beef noodles is the most common type of beef noodle in Taiwan. The beef is often stewed with the broth and simmered, sometimes for hours. Chefs also let the stock simmer for long periods of time with bone marrow; some vendors can cook the beef stock for over 24 hours. This type of beef noodle tends to be spicy because doubanjiang and five-spice powder are sometimes added. However, the broth may also have a sweeter taste if the fat from the beef is simmered. There are several variations with the soy-based broth, such as spicy, tomato, garlic, and herbal medicine. The tomato variation (番茄牛肉麵) is popular in Taiwan and features chunks of tomatoes in a rich red-coloured soy-tomato broth. 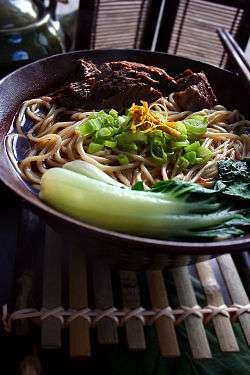 The Chinese Muslim style of beef noodles is also known as clear-broth or consommé-stewed beef noodles (清燉牛肉麵). It often uses halal (清真) meat and contains no soy sauce, resulting in more taste of the beef in the soup. Salt, red chilis, star anise, white pepper, and green onions are used to add flavoring to the soup. In halal restaurants, only quality local beef from the Taiwanese zebu (黃牛, lit. "yellow cattle") prepared by the local halal butcher is used for the beef noodles. Yaka mein is a type of beef noodle soup commonly found in Chinese restaurants in New Orleans. It consists of stewed beef, spaghetti noodles, hard-boiled egg and chopped green onions, with Cajun seasoning, chili powder or Old Bay-brand seasoning. ↑ "Beef Noodle Soup: Culinary Encyclopedia". ifood.tv. iFood TV. Retrieved 6 December 2013. ↑ "Taipei Beef Noodle Festival: Beef Noodle Tasting". tbnf.com.tw. Taipei Beef Noodle Fesitval. Archived from the original on 17 May 2011. Retrieved 6 December 2013. ↑ "Food Lovers Flock to Taipei Beef Noodle Festival". Focustaiwan.tw. Focus Taiwan News. Retrieved 6 December 2013. ↑ "2013 Taipei International Beef Noodle Festival". taipei.gov. Taipei City Government. Retrieved 6 December 2013. ↑ Lu, Yaodong. "What is Beef Noodle: Interview: Professor Lu, Yaodong, Expert in history of food and beverage". tbnf.com.tw. Taipei Beef Noodle Festival. Archived from the original on 17 May 2011. Retrieved 6 December 2013. ↑ "Taiwan Food Culture - Niuruo Mian (Beef Noodles)". taiwanfoodculture.net. Taiwan Food Culture News. Archived from the original on 18 December 2013. Retrieved 6 December 2013.